Of the people I met while working in outpatient hemodialysis, I was closest to “Sid.” He began dialysis just a few months after I started working there. Sid was relatively young, the divorced father of a married daughter with several children who lived nearby. His ex-wife had died of pancreatic cancer the previous year, and before her death the family had reconciled. Sid had a heart attack and triple-vessel coronary artery bypass about ten years before I met him, as well as a more recent below-the-knee amputation of his left leg. He walked well with a prosthesis and did not require a cane, though his activity tolerance was poor and he became winded after climbing a few stairs. Sid needed hemodialysis for end stage renal disease, which itself was the result of extensive diabetic nephropathy. I later learned from his daughter that Sid had been very anxious about coming to dialysis at first, even though by then he had been through more hospitalizations and surgeries than most people. She also said that he quickly came to enjoy and value his time at the center, in part because it brought him in contact with the same group of patients and staff, three times each week. That’s one of the advantages of working in this setting - consistent contact. From the point of view of his dialysis treatments, Sid’s care was pretty routine and uneventful. He experienced very few of the common side effects of treatment, such as symptomatic hypotension and cramping, and his overall clearances, a measure of the effectiveness of his treatments, were generally good. One day as I was initiating his treatment, I noticed that Sid had a small bandaid around the tip of his left ring finger. There was some slight redness under the proximal edge of the bandaid. "What’s up with that?" I asked. "Oh, I had a hangnail the other day and pulled it out," he replied, showing me with a gesture how he had brought the cuticle to his mouth and bitten it with his front teeth. After his treatment was underway, I removed the band-aid to take a closer look. He had a small ulceration about the size of of a grain of rice at the base of his fingernail, with redness and swelling down to his first knuckle. I contacted his nephrologist, who ordered a dose of vancomycin for the final 30 minutes of his treatment. That was pretty much our standard protocol for dealing with infections in that setting - intravenous vancomycin, gentamycin, or tobramycin one or more times each week, with lab measurements of peak and trough values to maximize the effect while minimizing the dose. But over the course of several weeks, Sid’s cellulitis slowly and inexorably made its way down his ring finger and onto his hand, where it affected his adjacent fingers and continued to his lower arm. The inflamed areas in turn became necrotic, until his entire left hand and forearm were hard and discolored. Surgical intervention was ruled out, as Sid an unacceptably high risk candidate because of his compromised cardiac status - his left ventricular ejection fraction was measured at about 10% of total filling volume. Medical treatment of his infection was not successful because of his extensive peripheral vascular disease. Also because of his poor peripheral circulation, Sid had not had a successful AV fistula implanted for vascular access during his dialysis treatments. Instead he relied on a tunneled double-lumen central venous catheter (CVC) as the portal for his dialysis treatments. CVC’s carry a high risk of infection, and one night during his treatment Sid developed shaking chills and a fever of 103, requiring immediate transport to the hospital by ambulance for possible septicemia. I never saw Sid again after that night. I later learned the surgeons presented him with the option of having his entire left arm amputated at the shoulder. They were candid with him about the fact that he might not survive the surgery because of his poor cardiac status. 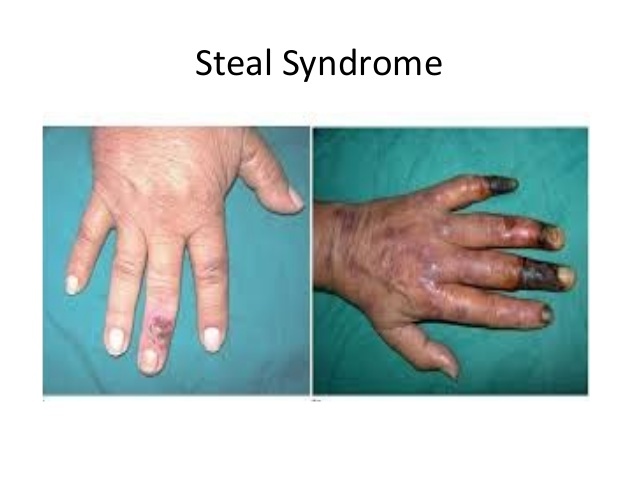 They also noted that he would likely need to have his right arm amputated, as it too was becoming ischemic from “steal syndrome” caused by his non-functioning fistula. Sid decided that life without one or both arms was not worth living. He chose instead to have his CVC removed and his dialysis treatments stopped. He moved in with his daughter with the support of hospice for the last two weeks of his life. Working with patients who have end stage renal disease isn’t relentlessly dreary, because there are also "happy endings," like when a patient gets a kidney transplant. When that happens, we all celebrate. Sid's decision and outcome was sad, but it wasn't dreary. He took control, made the important decisions himself and spent his final weeks with his daughter and grandchildren, in the comfort of their home, with medication and support. Isn't that how we'd all like to go? We got a card at the unit from Sid's daughter, thanking us for taking care of her dad through what turned out to be his final 5 months, and letting us know that he really came to enjoy his time at the unit. I also sent his daughter a sympathy card, and told her that I was glad for the chance to meet Sid. He really was a nice guy. We also spoke with each of the other 11 patients who shared Sid's treatment time, so that all of us could acknowledge what had happened. Then we continued their treatments. I'm a nurse working in cancer care and find the same thing, rewarding work that can be very sad but can also be wonderful. Thanks, Lily. Glad you're doing it.